10 Best Ice Skating Rinks in Maryland! rinks open year-round. If you want to learn to skate or your child wants to join a hockey league, it is easy to do when you live in this state. Plus, with incredible outdoor rinks that are open seasonally, you can enjoy the winter festivities in the great outdoors. Most of these rinks offer lessons so if you don’t know how to sake, there’s no better time to learn! The Rockville Ice Arena is Montgomery County's top destination for hockey and ice skating. There are three full-size rinks so that skaters can play hockey, enjoy figure skating, and participate in open skate at the same time. They offer lessons, host the Montgomery Youth Hockey Association, is home to the MAPHL Champion Landon Bears, as well as the Washington Pride. The arena also hosts an ice skating academy and speed skating club among others. With an onsite café, you can stay for the day plus enjoy lunch when you get hungry. In winter, you can skate at the Columbia Association Ice Rink, take lessons, play hockey, or learn to figure skate. This is an indoor ice rink that can be enjoyed year-round. Ice World is mammoth. It is a place where you can go to take freestyle lessons or to join the hockey team. They have regular hockey camps, lessons that parents and children can take together, adult lessons and more. They also host regular competitions which can be plenty of fun to skate in or watch. They have a pro shop, two NHL-sized rinks, eight locker rooms, plus seating for 300. Another year-round rink, the Bowie Ice Arena opened more than 45 years ago. You can buy passes for open skate or enjoy various classes to improve your skills. This is an indoor ice skating rink that offers incredibly affordable lessons. For example, you can take seven weeks of ice skating lessons for only $105. They teach ages four and up so even your preschooler can learn. They also have fun promotions like $2 off on NFL Sundays. If you want to skate in an adult hockey league you can do so at Piney Orchard. They have a figure skating team that was formed in 1997, teaching children of all ages to skate and compete. They also host birthday parties and other fun activities this is an ice rink that the entire family can enjoy. Run by the Baltimore City Department of Recreation and Parks, this arena hosts hockey games, recreational skating, offers lessons and more. World Champion Kimmie Meissner started her skating career at the Mount Pleasant Ice Arena and will sometimes stop by to offer a lesson. If you would prefer to ice skate outdoors and enjoy the glory of winter around you, head to Quiet Waters Park instead of an indoor rink. Open seasonally, you can stay here all winter long, enjoy the music and watch your friends walk by. Plus, there are walking trails and playgrounds that non-skaters in your group can enjoy. 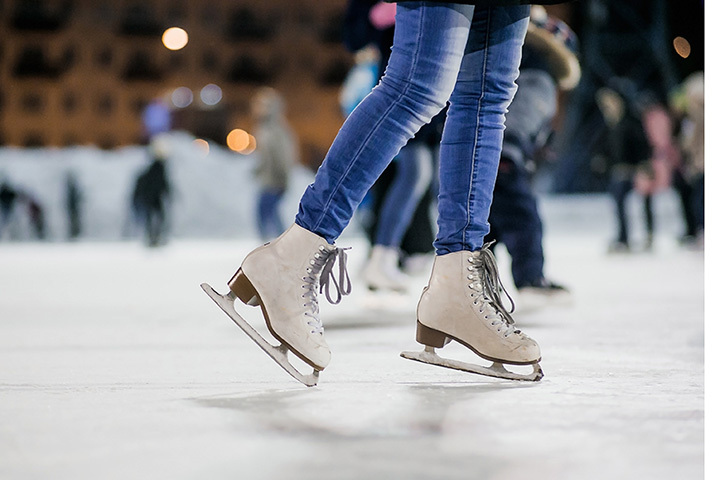 Make a date or a day out of it by heading to Silver Spring Ice Skating Rink at Veterans Plaza. This is an outdoor rink that is open seasonally but it is surrounded by fantastic shops and restaurants. This makes it easy to go skate, then grab a drink at a local pub or take your kids out for a burger. With a movie theater next door, you can even relax your feet while catching the latest flick. A Baltimore staple, the Inner Harbor Ice Rink is a fun addition to downtown Baltimore during the winter. You can skate outdoors and then enjoy the many activities that grace the Inner Harbor area. Dining at fabulous restaurants, listening to a live band, watching a show, going to the aquarium and more can all be done within minutes of finishing your skating session. View more Maryland Ice Skating Rinks.